BG EPR® eliminates blow-by | BG Products, Inc. I have a 2004 Stingray boat with the 3.0 MerCruiser® engine in it. Since I bought it in 2006, the gas engine produced a huge amount of blow-by which forces oil from the fill cap and produces quite a mess. 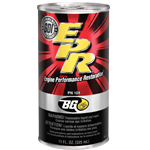 This season, I ran a can of BG EPR® through it at 2,000 RPM for 45 minutes to try to solve the blow-by issue. Draining the oil and adding BG MOA® after, I took the boat out for the day and upon returning home found the top of the engine completely clean and oil free. BG EPR® is an amazing product of which I recommend and sell to my customers and my personal experience with my boat solidifies my belief in your products. Thanks for being on the forefront of fluid technologies.